In contrast with the first Phase of the Research Group, these sessions were now held in pubic, which meant that anyone who registered with the PHI on time could take part in these sessions. The participation fee for a full-day session including breaks for lunch and tea was DM 300.00. 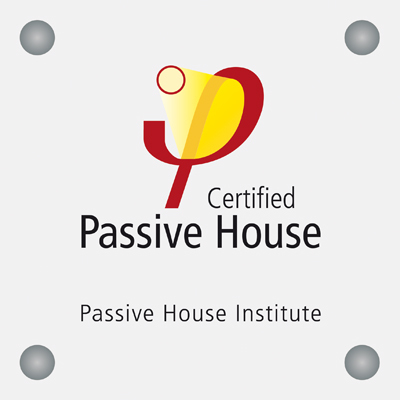 A discount of 20% was given to specific members of the Passive House Information Group and the number of participants was restricted to a maximum of 50 for each session. Documentation of the Research Group Sessions takes place in the form of Research Group Volume (in German) which are published by the PHI and are available for purchase. A correctly calculated energy balance is the key to optimisation of energy-efficient buildings, particularly of Passive Houses. The European standard DIN EN 832 was an established and reliable basis for such balances. 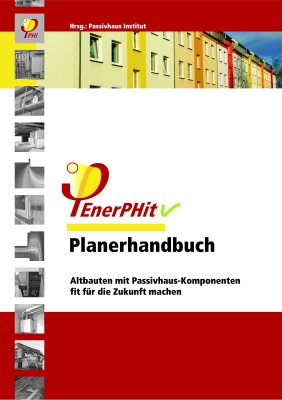 The "Manual for Energy-efficient Planning of Buildings" was developed by the German Institute for Housing and Environment (IWU) from the Swiss standard SIA 280 which was valid at that time during the early days of the low-energy construction method and was characterised by its transparency and ease of use. The results that were gained from the annual method in accordance with the Passive House variant PHPP corresponded excellently with the values from the monthly method in the European standard and with the simulation using dynamic calculation methods. Thus this manual was the preferred tool for planning, optimisation and evaluation of Passive Houses. The window is the solar collector for the Passive House. The requirements for Passive House suitable windows are particularly high due to reasons of thermal comfort: the k-values must be smaller than 0.8 W/(m²K). A secondary effect is the high quality in terms of building physics: the interior surfaces of Passive House windows remain free of condensation under normal living conditions. Glazing continued to be developed further with reference to the greatest possible utilisation of solar energy. Passive House suitable window frames reached a standard of quality that could not have been thought possible a few year earlier. New techniques for edge seals provided the prospect of even further improvement. The Research Group provided designers with information for correct installation, (airtightness, absence of thermal bridges at the connection), for the energy balance in winter and for thermal comfort in summer. It is often thought that the excellent standard of thermal protection which is necessary for Passive Houses in the winter would lead to serious problems with overheating in the summer. 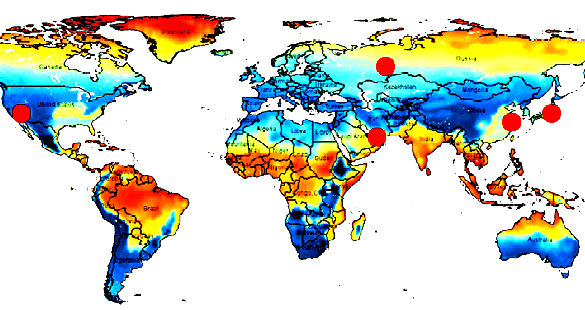 In a comprehensive study of the summer case, the Passive House Institute demonstrated that a better standard of thermal protection did not worsen the indoor summer climate - in fact thermal comfort in summer can even be improved if some essential principles are adhered to. 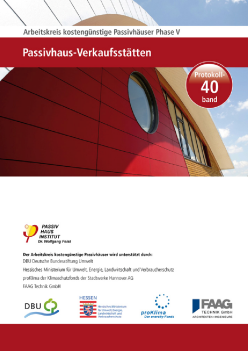 Experience with the first Passive House in Darmstadt Kranichstein and an office building in Cölbe confirmed the fact that an excellent indoor climate prevails in optimised Passive Houses in summer even without active air conditioning. Strictly speaking, a building envelope cannot really be "thermal bridge free", but it is convenient to define "thermal bridge free" in a general sense so that the heat loss calculated using the exterior surfaces of the standard building components is not less than that determined properly by taking into account all thermal bridges. This too is a high requirement which is usually not met by the constructions used today. However, numerous examples of details developed for Passive Houses demonstrate that "thermal bridge free design" is technically possible and economically attractive. For experienced designers, the basic principles are not hard to learn; the benefit is considerable: thermal bridge free details not only result in considerable energy savings, but they also facilitate planning and lead to an unprecedented quality of construction work. Ventilation systems with heat recovery are indispensable in Passive Houses. Extremely positive experiences were obtained with these systems in the Passive Houses built previously; however, this can only be possible if the chosen components, planning, and construction supervision are of a high standard. The fundamental principle is that the ventilation system should primarily ensure a good quality of air; although it may be also be used for other purposes in individual cases, this should not interfere with the primary objective. The topics dealt with included the basic rules for planning of the building and ductwork, dimensioning of the systems, positioning of the air outlets, air quantities and regulation. Efficiency of the heat exchanger, electrical efficiency of the ventilators and experiences relating to air quality in already built houses were also discussed. Proper functioning of Passive Houses depends to a great extent on the quality of the construction work that is carried out on site. Any discrepancies due to remaining small leaks or careless thermal bridges may in some circumstances jeopardise serviceability of the house fundamentally, particularly if the heat recovery efficiency actually is limited to the extent necessary for exploiting the cost advantage. Errors in implementation can be excluded by means of comprehensive quality assurance. For this, methods and tools were developed and tested during the preliminary pilot projects. Methods were presented for measurement of airtightness, adjustment and control of the ventilation systems, and for thermographic verification of the construction work with reference to thermal bridges, and their application and evaluation were explained. In urban construction, influencing factors in terms of energy can be shown in a simplified form by the heat loss characteristics and solar access in the settlement pattern. In urban planning the compactness of a settlement pattern is mainly determined by the choice of construction method, shape and building type. Because the passive solar gains provide the major contribution towards heating in Passive Houses, these rely on optimal orientation towards the sun and on the minimisation of shading by other structures. An interesting fact is that the compactness of the building particularly with reference to balanced distribution of sunlight plays a major role. The psychological aspects of sunlight in homes due to the use of solar radiation for energy and social purposes have a direct bearing on significantly better living quality in Passive Houses. The main orientation towards the south is an important means of ensuring the standard for Passive Houses ("solar access"). In order to avoid rigid urban planning solely on the basis of south-facing rows of buildings, strategies need to be developed for spatial differentiation with the greatest possible balanced distribution of sunlight at the same time. The tremendous importance of the building depth for the compactness and solar access has direct impact on the layout: this puts into question the conventional view which teaches that there should be a contrast between deep layouts oriented towards the east/west and narrow layouts oriented towards the south. The approach for standardisation of the development of cost-effective Passive Houses to date would take into account the aspects of contemporary forms of housing and ensure a distinctive character of the housing in terms of space and design. Passive House housing estates would then be developed based on standard houses. Taking previous experiences with Passive Houses further into the town-planning dimension can thus lead to a more substantiated "solar town planning" with the objective of future-oriented housing and settlements. The recent discussion by suppliers of grid-based energy resulted in the widespread belief that low-energy houses (which already consume more energy than Passive Houses with their consumption of between 30-70 kWh/(m²a)) can no longer be cost-effectively connected with district heating networks or even the gas network. How could connection to a district heat network for Passive Houses be worthwhile when these require almost no heating? Interestingly, in two of the latest Passive House housing projects independently of each other, it was found that local heating represented the most economical variant in these specific cases. These findings also provide important information on how settlements with low-energy houses can generally be supplied with heat in a cost-effective way. Local heating for Passive Houses?